If you&apos;re looking for American style food and breakfast served all day, then Paradise Restaurant and Bar in Plover is for you. With large portions, be sure to come hungry and leave satisfied! Rock-n-Roll Cafe in Stevens Point is a hidden gem with home style cuisine served with a smile. With 50s decor, breakfast available all day, and a large lunch menu, this diner is definitely worth the trip. This hometown favorite, around since the 70s, features old fashioned recipes that your whole family is sure to love! Better yet, South Point is open 24/7, so you can fix your cravings at any hour. The Hidden Cafe, located inside of Galaxy Comics and Games in downtown Stevens Point, truly lives up to its name! Stop by to shop and snack on a variety of unique and yummy paninis, sandwiches, plates, and snacks. Just don&apos;t skip the noteworthy not-your-Mama&apos;s Potato Salad. Tucked away in Polonia is Polonia Cafe, a small diner with a large personality. With a welcoming environment, breakfast, lunch, Friday Night Fish Fry, and amazing homemade pie selection, Polonia Cafe is a must try! Cozy Kitchen downtown is the oldest established and long-loved restaurant in Stevens Point for a reason! You won&apos;t regret stopping in to try one of their homemade soups, pies, desserts, or daily specials. And, start with the pie, we won&apos;t judge. Serving up American and Greek style breakfast, lunch, and dinner, Olympia Family Restaurant is a hometown favorite worth the try. With plenty of seating and many food options, Olympia will be sure to fill you up! For homemade comfort food with a hometown feel, check out RD&apos;s Diner. With breakfast served all day, everyday, and a yummy Friday Night Fish Fry, your whole family will be sure to find something they love. For a diner with a spooky side, check out The Cottage Cafe in Plover! The Cottage Cafe offers breakfast, lunch, and bakery goods, as well as a haunted location, that makes it totally unique. Heads up, this location is closed December-April. With a charming atmosphere and unique offerings of the day, The Watchman&apos;s Gone will surprise you as you fall in love with it. Check out this hidden gem tucked away in Stevens Point! Located on Church Street in Stevens Point, Park Ridge Cafe serves American and Greek style food with a smile! Stop in any time of the day for breakfast, lunch, or dinner and get ready to enjoy. Ambrosia Pub and Grill, located in Amherst, is definitely worth the drive! You and your family will be sure to love their American dining and comfort food, and the best Bloody Mary in Amherst. 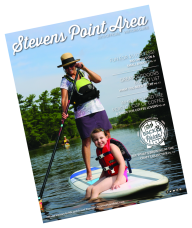 Click here for a full list of Stevens Point Area restaurants, and be sure to tag #StevensPointArea to have your picture appear on our page! Thank you to Thousand Lumens Productions for the amazing header image shot!